Poetry Friday round-up is with Carol at Carol’s Corner. My mother-in-law just returned from a trip to Whidbey Island in Washington where she did some amazing bird watching with her second son’s family. I was most intrigued by her description of the western sandpiper’s murmuration. I’ve only seen murmurations on video. I’d love to see one is real life. Breathtaking! If you read my poem on Laura’s site (we post them in the comments), you may notice a correction in the breed of bird from sandhill crane to dunlin sandpiper. I did some fact checking. Mary Lee Hahn invited us to join her in a December haiku-a-day project. I’ve started early. 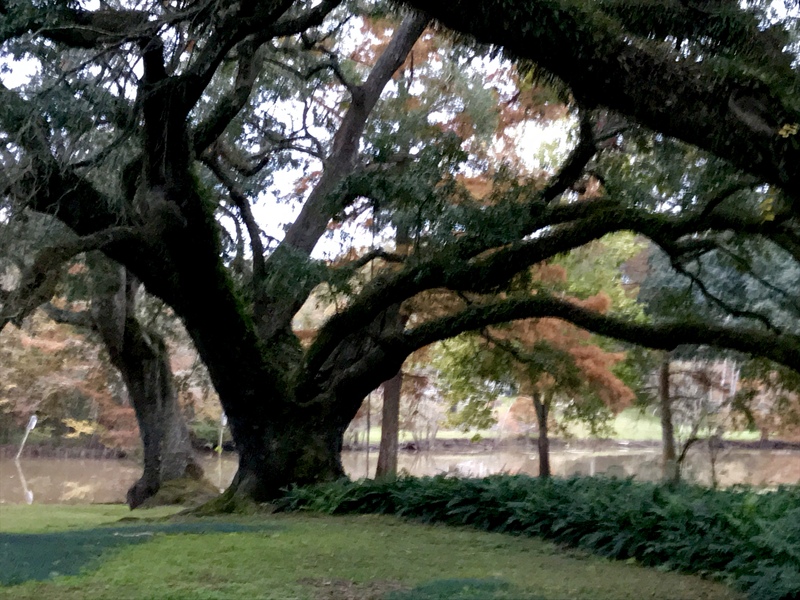 When I returned from my morning walk, I took this picture of grandmother oak, but what I noticed was the color of the cypress tree behind her. I don’t usually see this color. Most of the time, the cypress trees quickly shed their needles. I wonder why they are holding on longer this fall. 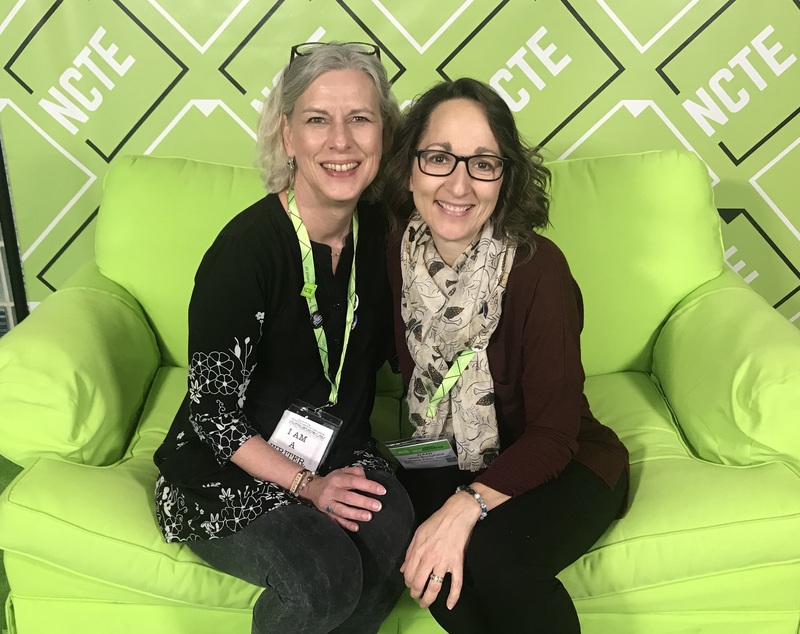 At NCTE 2018, I was excited to attend a session, Why Notebooks?, that some of my favorite people were leading: Jen Cherry, Amy Ludwig VanDerwater, Michelle Haseltine, and Linda Urban. I’ve been a notebooker for some time now, and I always have my students decorate a marbleized journal at the beginning of the year, so I was drawn to finding more ways to use notebooks in my classroom. As someone who loves little notebooks, I was delighted that there were handmade notebooks for us to keep (folded unlined paper with a colored cardstock cover). They passed around puffy stickers for us to choose from. I felt the thrill of creating something new. Personalizes learning by providing choice. Michelle Haseltine prompted us to write an invitation to our notebooks. 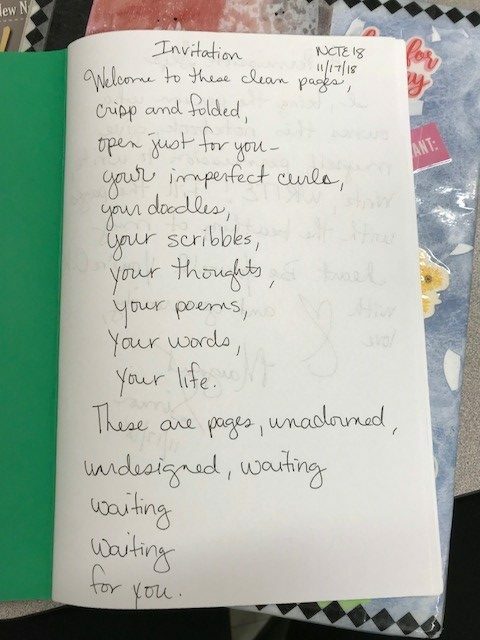 On the first clean white page of the little green notebook, I wrote this poem. I made a commitment to myself to be more intentional about notebook writing with my students. On our first day back after Thanksgiving break, I asked my students to get out their notebooks. In order to provide a structure that honors choice, I thought back to a workshop I attended with our Louisiana Poet Laureate Jack Bedell who told us about William Staffords’ daily writing discipline. I set the timer for ten minutes and we wrote. Some shared. And some found their next blog post. “I’m going to use this for my Slice of Life.” We were doing the work of real writers. We’ve been using the 365 Days of Wonder for quotes of the day, but I wasn’t doing anything more with it than having a student choose one and write it on a frame of glass. They were enjoying the process of choosing and would often naturally start a conversation around the chosen quote. Adding it to our daily notebook page gives more attention to the quote as well as possibly inspiring more writing. As we get more and more adept at writing in our notebooks every day, my students and I will reap the benefits of sharing in a writing community. Why Notebooks? So many reasons. Pull them out of the desks, booksacks, or cubbies and just do it! You’ll be glad you did. 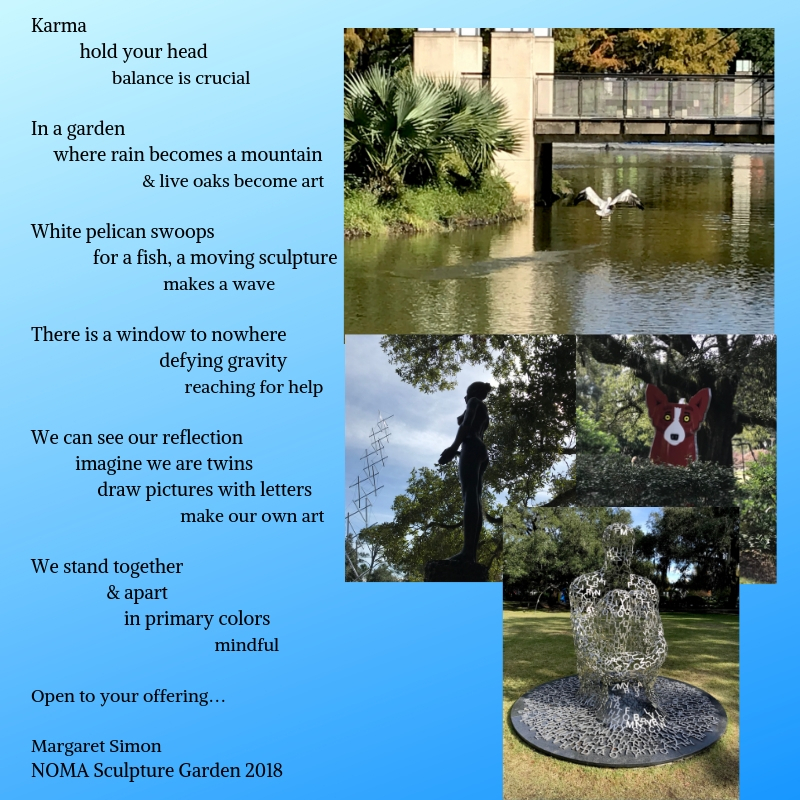 Spending some time in New Orleans filled me with inspiration, especially in the Syndey and Walda Besthoff Sculpture Garden at the New Orleans Museum of Art. I took pictures and found a poem. My friend, Dani Burtsfield from Montana, walked with me and found her own poem. The two compliment each other like we do as friends. 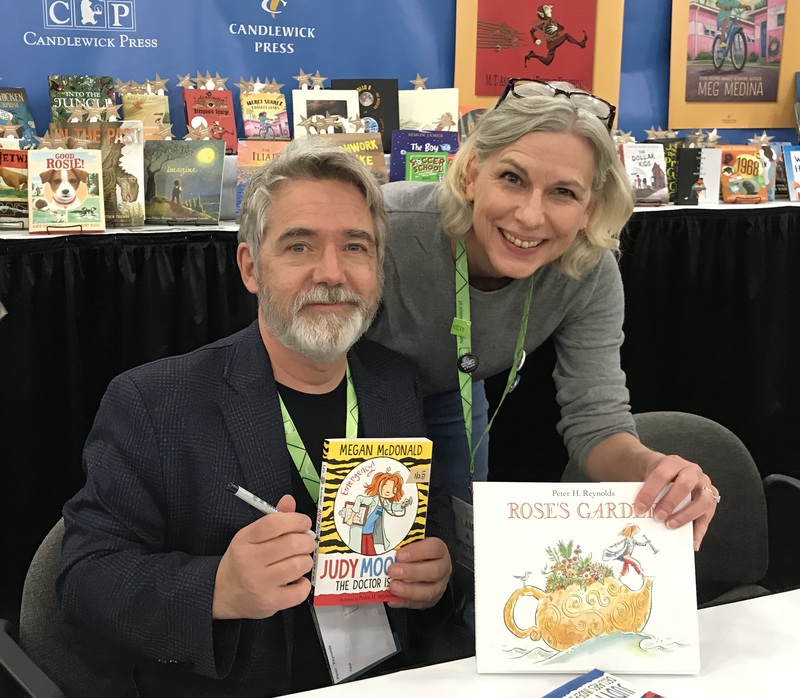 In his keynote with his twin brother Paul, Peter Reynolds said, “Your brain is beautiful.” Everywhere I went, everyone I met helped me to believe this is true. 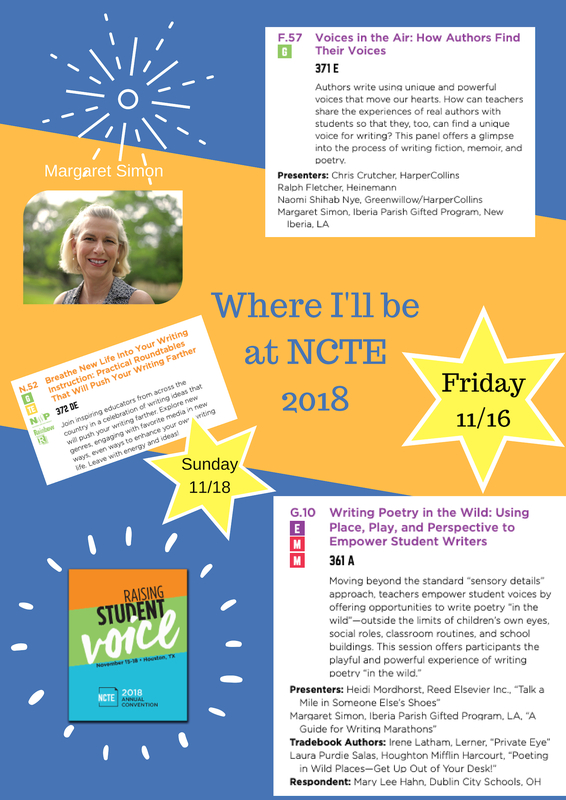 My husband calls the NCTE conference “hobnobbing with your fellow wizards.” My fellow wizards include poets from Poetry Friday, teacher-writers from Two Writing Teachers and TeachWrite, and dedicated educators from Good to Great. These people are my tribe. 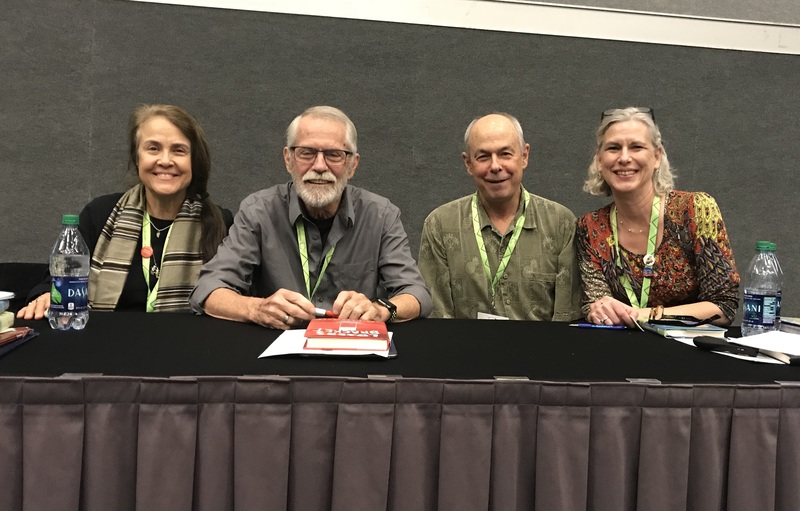 I was so privileged to be able to present with Ralph Fletcher, Naomi Shihab Nye, and Chris Crutcher on the theme of Voices in the Air. These three authors are inspirational and powerful speakers. Their message was one of hope, that when we write and put our voices out in the world, someone will be touched by it. On a panel with my Poetry Friday peeps, Heidi Mordhorst, Laura Purdie Salas, Mary Lee Hahn, and Irene Latham, we inspired teachers to take their students outside of the classroom to write in the wild. We talked about exploring the world through other perspectives and looking more closely. 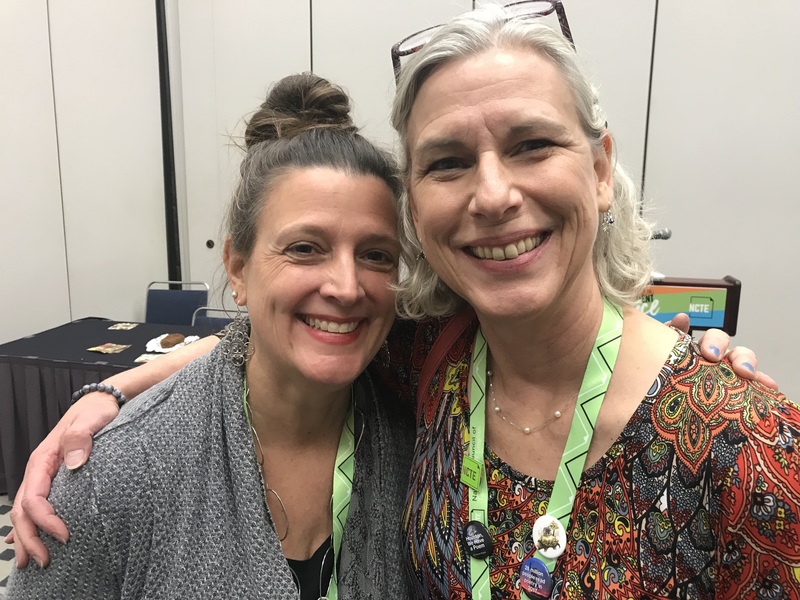 In a session with Michelle Haseltine, Amy Ludwig VanDerwater, Linda Urban, and Jen Cherry, I felt renewed interest in writer’s notebooks, in providing a place for students to be themselves, to encourage mindfulness, build stamina, and encourage risk. I felt braver writing in my own notebook, realizing that there is no perfect way to keep a notebook, my notebook is mine, and I should give my students more opportunities for free writing. Sitting beside my students, I will have these people with me. I am full! I am rich! I am renewed! 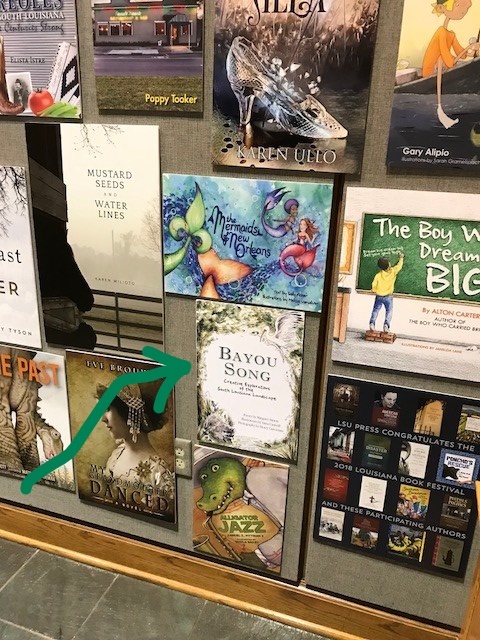 Bayou Song is on the wall of books! The rains had ended, the cool front came through, adding an element of celebration (like Christmas) to the Louisiana Book Festival. This year was the 15th annual book festival and the 15th awards ceremony for LA Writes, our state youth writing contest. I have been involved since the first contest and the first book festival. I always marvel at the young authors as they arrive dressed up with their whole extended families with them. It is an event for celebrating good writing and for families celebrating their authors. 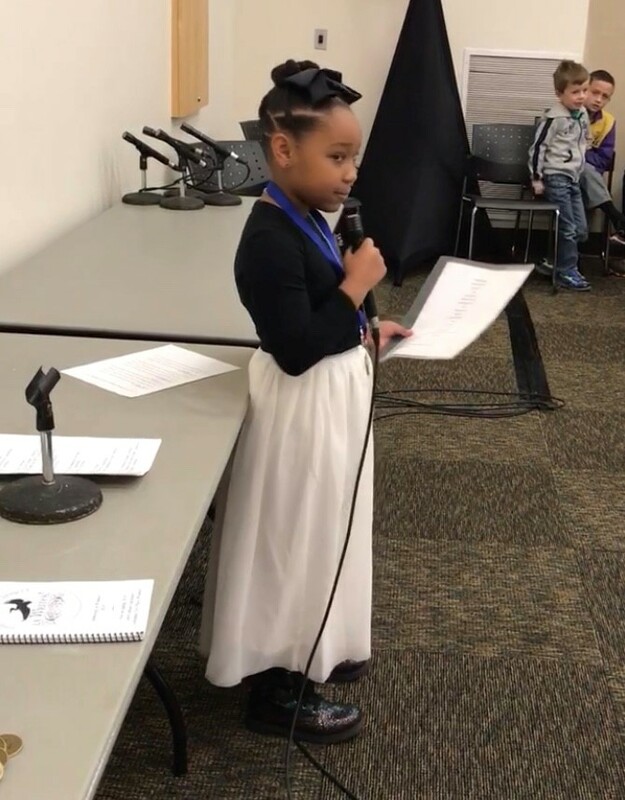 My student Chloe reads her winning poem, Cool Words. Following the wonderful awards ceremony, I offered a student writing workshop. You never really know what kind of audience to expect. I was delighted to have 3 writers join me. One was a 6-year-old who wrote and drew, then buzzed around. Her mother said, “She’s doing a lap.” Then she was back to writing and drawing. The other two girls were a sister pair. The older sister is a student at LSU. I am not accustomed to teaching college kids, but I was pleasantly surprised at how she responded to my prompts. She wrote an I am poem about the river. (Baton Rouge is located on the Mississippi River.) When I taught them about the zeno poem, she transformed her I am poem into a zeno. This was an unexpected transfer that worked well for her poem. She gave me permission to publish it here. I am a rusted red river. 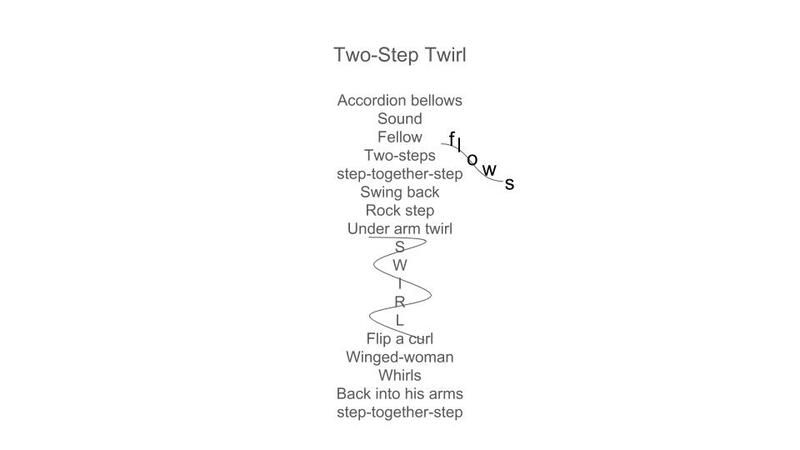 Thanks, Jami, for enriching our lives with your poem and for showing me how a simple (meant for elementary kids) prompt can be transformed into a sophisticated and profound poem. 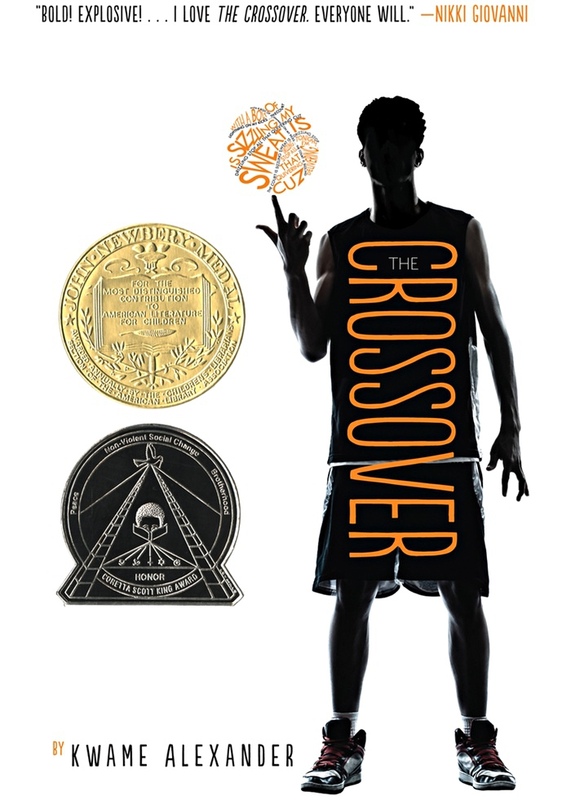 Poetry Friday round-up is with Michelle at Today’s Little Ditty..
I’ve been reading aloud Kwame Alexander’s Newbery Award winning book in verse, The Crossover. This is a great book to read aloud, but it’s also visually appealing. I don’t think there is a name for this form of writing when the written words express the feeling of the word. But my kids got it! Such a fun way to write about sports. Of course, I wrote about dancing. 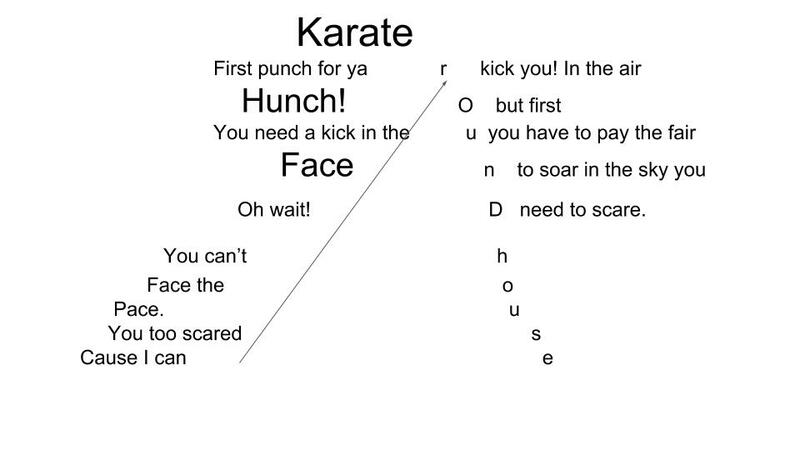 Have some fun with the way the words look on the page, Kwame style! Will my team really loose? Will they think we’re fools? NO, NOT IN THIS LIFE NOR THE NEXT!!!!!! !